The 48th Social Media Breakfast hosted by Twitsnaps (owned by Compare Infobase Limited) started off with welcoming two new members at the MeetUpat Sagar Ratna, Janak Puri west, at 8:30 AM. 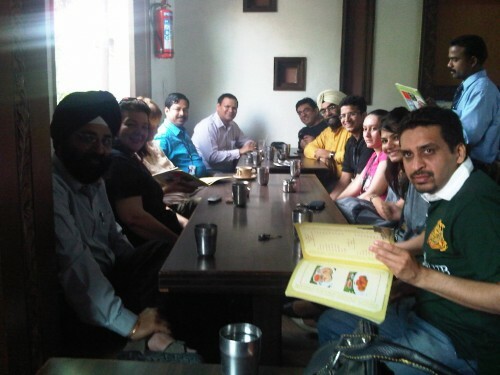 “Is Social Group Buying really working in India?” was the topic of discussion at the Meetup. Members confessed that they hardly make online group purchases, as they found it not so convincing as compared to the physical shopping. · Indian market is heterorganic in nature; cultural aspect has a great impact on purchase behaviour and pattern. · India is a very vast country, It has geographic stretch is so much that localizing becomes very difficult for the sites. Though Groupon is quite successful in sending geographically targeted deals but it is not able to bring about great business within India as yet. · Big Bazaar that operated on similar grounds as far as discounts and offers are considered worked fairly well, but not on web presence in which Futurebazaar.com failed. · Products in India are so competitive in nature that, a little margin would be left for the web business handling group buying. · eBay succeeded in India after they changed their working model according to Indian Market. · Credibility is a factor that has to be tackled by these sites no matter wherever they are based. A proper branding and brand awareness can help them a lot. · E-Commerce is not that popular in India is a deterring factor to group buying anyways. · Huge volume of population is another factor. People here trust references than deals over Internet. · Groupon and other sites are facing problem, as merchants are not seeing the brand loyalty being generated, though brand awareness is actually being generated in the process. The 48th SMBTS, Meetup speculates that Social Group Buying will definitely be popular in coming years, as E-commerce gains popularity. In future these sites will evolve a model and will adapt to the Indian Market. India is a country with huge population, massive geographic spread, and cultural and linguistic diversities. These factors are of high priority and have to be taken into consideration to operate profitably and popularly in the Indian Market. How would it feel if a technology offers users the ability to talk to the Web and create ‘voice’ sites using mobile phones? This is indeed what HSTP will do. Developed by the IBM research team in India, HSTP – they define it as ‘a protocol to seamlessly connect telephony voice applications.HSTP shall enable the users to browse across voice applications by navigating the Hyper speech content in a voice application’. It enables voice-driven transactions that can span multiple cross-enterprise voice applications and allows easy interconnection across voice applications and this can be used for providing a seamless browsing experience to the telephony user. It will enable users to browse across voice applications by navigating the Hyperspeech (the voice hyperlink) content in a voice application. The so called “spoken web” will be a network of voice sites created using mobile phones. Given India’s position as the fastest growing mobile phone market in the world, this new protocol may be particularly useful in India. The paper can be read at http://domino.research.ibm.com/comm/research_people.nsf/pages/arun_kumar.pubs.html/$file/ht07.pdf. So lets talk to the web………!